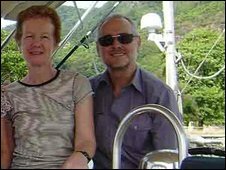 A British man kidnapped with his wife by armed pirates while they slept aboard their yacht in the Indian Ocean has said they are being treated well. Paul Chandler, from Tunbridge Wells in Kent, speaking by phone to the BBC's Somali Service, said: "We are well and being looked after okay." He added they were being fed, and "food is okay at the moment". Mr Chandler, 59, and his wife, Rachel, 55, were taken hostage by gunmen in the early hours of Friday. The armed pirates forced the pair to sail towards Somalia after their boat was captured. Searches for the Chandlers began on Friday after they sent a distress signal. 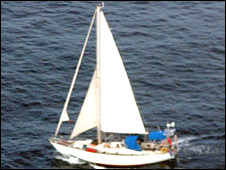 Their yacht was found during counter-piracy operations after a multi-national search. Speaking to ITV news earlier, Mr Chandler said: "I was off watch. I was asleep and men with guns came aboard. It was on Friday last week at 0230." He said the couple were being held hostage on a Singapore-registered container ship called the Kota Wajah. He was speaking from the captain's cabin at 1100 GMT (1400 local time). He said their captors had not officially asked for a ransom and that they were currently being held hostage on board a container ship. "They kept asking for money and took everything of value on the boat," he added. He said the vessel was then about a mile off the coast of Somalia, and the nearest town was Ubdu. Correspondents say he may have been referring to Hobyo. Local fishermen reported seeing the Chandlers being taken to a village in Somalia after the telephone call. One of the fishermen, Dahir Dabadhahan, said two boats arrived in the village of Ceel Huur, near the pirate stronghold Harardheere, and were met by a convoy of about 30 other pirates in six luxury vehicles. He said: "The pirates opened fire into the air, waving us to move away." But when asked by the BBC later if they were in Somalia, Mr Chandler replied: "I can't answer that." He was also asked if negotiations had begun for their release, but said he was not aware they had. A spokeswoman for the Foreign and Commonwealth Office said: "Hostage taking is never justified. "Paul and Rachel are blameless tourists and they should be released immediately and unconditionally. "The families are deeply concerned for the safety of their loved ones. "Foreign and Commonwealth Office staff are in close contact with them and are offering support." Whitehall officials said Cobra, the Cabinet Office crisis management team, had met several times over the kidnapping of the Chandlers. The BBC's security correspondent Frank Gardner said yacht kidnappings had not always ended well because they were not straightforward commercial transactions. He said: "There is no big international shipping company that is going to say, 'We are going to get these people out because they are our employees and we will dip into the insurance for this'." He said the Foreign Office had taken a lead on negotiations and Scotland Yard also had hostage negotiators working on the case, but the pirates also needed to appoint a negotiator. "The British government does not want to be seen as the people who decide how much is going to be paid because the British government does not pay ransoms," he added. Earlier, the Ministry of Defence said the couple's empty yacht had been found. A spokesman said Royal Navy vessels operating with international partners under EU, Nato and combined maritime forces would continue to play a full role in efforts to secure their release. Relatives of the Chandlers met the Somali premier Omar Sharmarke in London on Wednesday. He told them he would do anything to "see a peaceful solution". The Somali Government - which only has nominal authority in large parts of the country - said it was doing everything possible to locate the couple. Mr and Mrs Chandler had been sailing from the Seychelles to Tanzania.